Kooper was diagnosed with Hypertrophic Cardiomyopathy in 2012 just 2 weeks after his brother, Case, was diagnosed. HCM is a genetic disease causing the walls of the heart to abnormally thicken. As with many heart conditions, pulling all competitive sports and activities is the first thing they did. Kooper was diagnosed the same week he was going to start his 7th grade year off as quarterback of his football team. This was a huge adjustment for a fit, active, athletic kid! It has been 6 years since his diagnosis and Kooper has found many things he loves and enjoys. He is an avid hunter and is learning guitar. 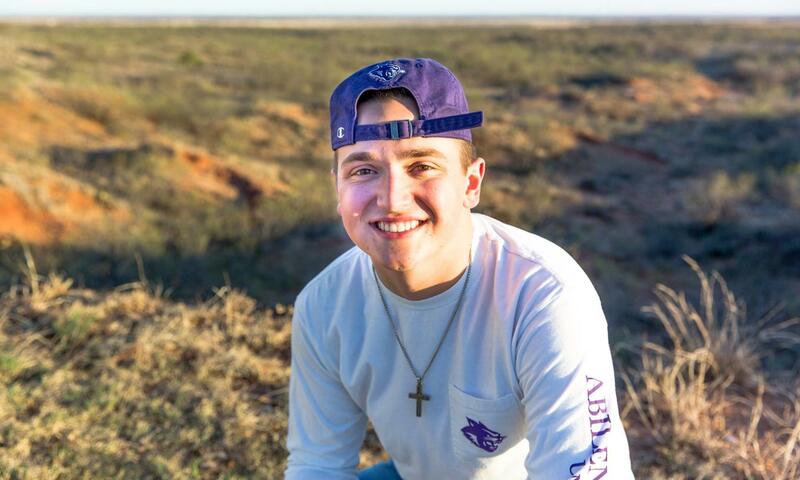 He is now a freshman bible/missions major at Abilene Christian University and plans to minister to youth and family. 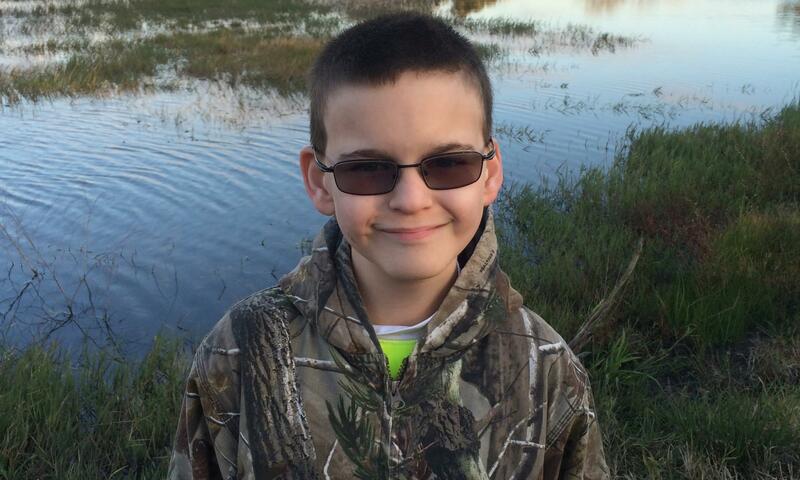 His time at the Hunt With Heart camp last spring gave him a chance to spend quality time with other kids with the same health challenges as him. 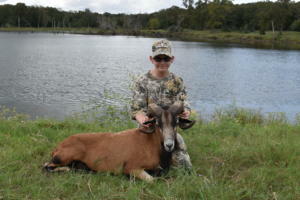 Harvesting a big Corsicana Ram topped off a great weekend! 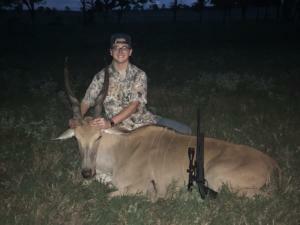 This fall, he was able to be junior counselor for HWH and was blessed to get a huge, beautiful Eland. What a memory and experience he will never forget! Thanks to HWH! We are proud to be part of the HWH family! The day Raymond was born was full of commotion, anticipation and excitement. they were late getting me in to the delivery room Velinda was not doing so good cause her blood pressure was up high and they could not get it down, they brought me into the room and once she knew I was there her pressure started coming down, they were well into the C-section and Raymond popped out minutes after I was in the delivery room, so much for pictures. They were working on Raymond at the time and were giving him oxygen to bring him around; his first cry was like a kitten real soft and barely could be heard. After a few minutes of oxygen and crying they let me take him to see his mother and then off to the nursery. They measured him took his weight, cleaned him up and he got his first shot in this new world of being poked, prodded and examined. We were the proud parents of a baby boy 6lbs. 3oz. The day he was born the pediatrician examined him and detected a slight heart murmur, he then came to visit us in the room and the questions started, how are you doing , how is your family doing , dose any one in your family have heart problems that you know of . Then well we have detected a heart murmur in your baby boy and we are going to monitor him while he is in the nursery, and we may want to do an echo before he is discharged. That’s when things started getting fuzzy, things were not right and everything was slowing down in my mind. This was not happening! Things were happening so fast and then real slow, his doctor ordered an echo before his discharge but since he did not state that it was an emergency, the attending discharged us on a Saturday morning to go home since Raymond’s doctor was not on call for the weekend. Monday morning Raymond’s doctor called us first thing wanting to know why we did not have the echo done, then he went on to say he had ordered the echo to be done before his discharge. So, since he was discharged the calls started to get Raymond scheduled for a heart echo. But in the mean time he gave us instruction to keep an eye on Raymond and told us to watch for color changes in his fingers and legs and if he turned blue and stayed blue for several minutes to call 911, finally after two months he was scheduled for an echo. The day of the echo we did not know what to expect they sedated Raymond and ran the test, on the screen there were pictures of the heart and we could see it beating and red and blue colors going all over the place and no one would say any thing, we asked questions and all they would say is your doctor will let you know something after he reviewed the tape. several more doctors popped their head in the room and the would concentrate the picture in an area of the heart for more detail and more pictures the whole process took over 2 hours and they still were looking and different areas of the heart. Finally they were finished with the echo and we then went to the clinic, where we met with the cardiologist , at the time it didn’t dawn on us that there was a real problem , he said he was going to bring Raymond’s condition before the panel for discussion and he would call us for an other appointment after the panel has reviewed the case , we should have known this was serious when the cardiologists gave us all of his phone numbers and told us to call if anything changed in Raymond’s condition day or night. About three weeks went by and the panel met, we were called in for an appointment at TCH and we thought ok everything will be ok nothing is terribly wrong and the will be able to correct the problem with medication. Well the appointment was with the surgeon that was going to do Raymond’s surgery. SURGERY yes surgery. he was very straight forward and did not beat around the bush, he said Raymond had DORV and with out surgery his life expectancy was six months, at that time I believe I went into shock I could hear the doctor talking but all I could comprehend was bla bla bla . Everything went into slow motion and it was like I was seeing someone else, this was not happening to us. It couldn’t we have a beautiful little boy without any scars and they are talking open heart surgery and cutting him and he will have this tremendous scar on his chest. They discussed the surgery and told us that they would update us every hour on his condition during the surgery and if we had any questions. I don’t believe I comprehended any thing, here you just dropped this bomb shell and you want to know if I have any questions. They scheduled the surgery for when he was 6 months old. Till he turned six months old we had to watch very closely and check his condition at all times, Velinda would have me check on him in the mornings before going to work, just to make sure he was still breathing. I remember breaking down several times and some evenings I think I cried myself to sleep. I had several dreams or visions where I would be dreaming the worst and a voice would wake me up and say he will be fine I have a plan for him and everything would be calm and I would drift off to sleep again. There was a catholic priest that prayed with us for a while and then we checked in to the waiting room area. We had a little room that had a door that connects to the hall way to the surgery center, they gave us updates every hour on the hour all day long, I think Velinda got mad at me during this time because I slept during most of this time and would not tell her much of anything all day long. Raymond’s surgery was 12 and a ½ hour long; he was on the heart lung bypass machine 11 hours. He went straight into ICU after wards. that evening we got lucky and had a room at the Ronald McDonald house and she asked me how I could sleep when Raymond was in surgery, I told her that when you have a dream you want to come true, you don’t tell any one about it, and when you have a dream you don’t want to come true you tell everyone about it. well I finally told her of my dream I wanted it to come true, and surprisingly she said she had the same dream but she was too upset to sleep. After that night we spent the next seven days in ICU with Raymond, we could not sleep in the room but we could sleep in the waiting room at night. During this time, we learned how to care for him and how to pick him up to hold him, we also witnessed the power of touch and being around other people and the healing effect, this has on people that are ill. There was a little Hispanic girl in the next room, her parents had one vehicle and both parents worked so when they came to visit it was usually around 11 pm and they stayed 30 minuets to an hour each evening, the little girl went into cardiac arrest 3 times before the ICU administrator approached us, they wanted to know if they could move the little girl into Raymond’s room since we werethere all day long. they told us we could pick her up and hold her or we could just talk too her and maybe touch her to let her know someone was with her, so we did and in the evenings we would let the parents have time with their daughter without us in the room, come on this was usually around 11 pm to midnight so we were usually trying to let Raymond sleep any way. well with this human touch the little girl came around and started to improve and when we moved to the 15th floor the little girl was moved the same day so she was on the way to getting out as well. When we moved to the 15th floor we went through 5 days of training on how to care for a heart patient and change dressings and general care before we were discharged, for 15 days TCH was home. Today Raymond has overcome a lot of obstacles, his heart condition remains somewhat stable but the other diagnoses are continuing to rise so far, he has- Epilepsy, celiac disease, migraine headaches, seizures and Asperger’s syndrome. But we take one day at a time and live life to the fullest. Raymond is now 15 years old and we have given up on the school district and have been Home Schooling now for the last 5 years.